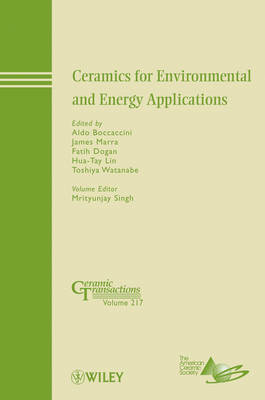 This volume is a collection of 17 papers from six symposia held during the 8th Pacific Rim Conference on Ceramic and Glass Technology (PACRIM-8) in Vancouver, British Columbia, Canada, May 31-June 5, 2009. These symposia include: * Glasses and Ceramics for Nuclear and Hazardous Waste Treatment * Solid Oxide Fuel Cells and Hydrogen Technology * Ceramics for Electric Energy Generation, Storage and Distribution * Photocatalytic Materials: Reaction, Processing, and Applications * Direct Thermal to Electrical Energy Conversion Materials and Applications PACRIM-8 is the eight in a series of international conferences on emerging ceramic technologies that began in 1993. PACRIM-8 was organized and sponsored by The American Ceramic Society and was endorsed by The Australian Ceramic Society, The Ceramic Society of Japan, The Chinese Ceramic Society, and The Korean Ceramic Society. A total of 862 experts, practitioners, and end users from forty-one countries attended PACRIM-8, making it one of the most successful ceramic science and engineering events in recent years.